This is Hashin-tei, the karesansui garden at Kodai-ji. It is located just behind the Chokushi-mon, and next to the Hojo. Kodai-ji is a Zen temple of the Rinzai sect in the Higashiyama area of Kyoto. 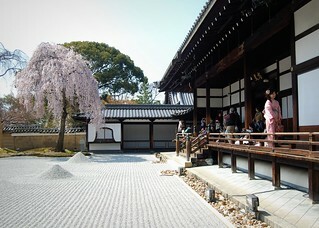 Hideyoshi's widow established the temple in the early 1600's in memory of her departed husband. What remains of the temple today is a beautiful garden, a few tea houses, and living quarters (kuri).